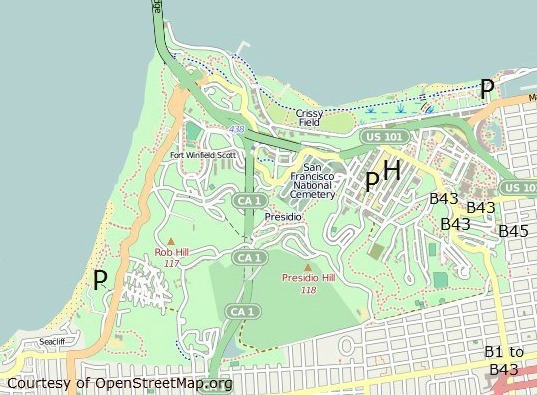 The Presidio San Francisco is an old military base on the northwest side of the city. Today, it's full of fun things to do including one of the largest military cemeteries on the West Coast, a high-end golf course, miles and miles of hiking and biking trails, and the Walt Disney Museum. Other fun things to do here include seeing several Andy Goldsworthy works of art, admiring the Star Wars statues at the Letterman Digital Arts Building, and exploring the old army batteries. You will also find fun, family-friendly weekly, monthly and annual events. You will also find some amazing outlooks with views of the Golden Gate Bridge, the SF Bay, and beyond. It's the perfect place to visit for those who love the outdoors. It's also perfect for anyone interested in military history. If you love both, then you must stop by for a visit. I head over here quite a bit for hiking, biking, or just to walk around. It's a peaceful retreat from the city and rich with history. Although it isn't overly crowded, you will find a surprising number of things to do here. 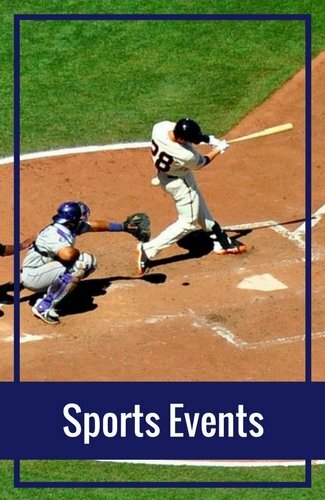 There are SO many fun things to do in the Presidio San Francisco. They include outdoor activities such as running, hiking, biking or just exploring nature. Other fun attractions include history museums, war memorials, nature centers, family-friendly fun, and so much more. Presidio Visitor Center: Located on the Main Post, the Visitor Center is the "front door" to the Presidio. Start your day at this newly opened facility, where you'll get a proper introduction to the park and find out about all the events and activities that are here for you to enjoy. The Visitor Center offers friendly staff, interactive exhibits, maps, and videos. You'll learn about the sight's fascinating history, as well as practical information like how to get around using the free PresidiGo Shuttle. Artwork by Andy Goldsworthy: Andy Goldsworthy is a British artist that is well known for creating artistic pieces that work well with nature. 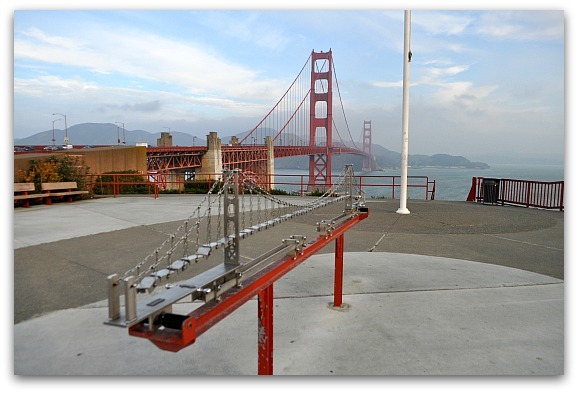 From 2008 to 2014, he install four nature friendly pieces within the Presidio San Francisco. Here is a little more about each one and where you will find them. Spire: This is his first installation. It's a 100-foot-tall tapering peak and fits in amazing well in its surroundings. This stunning piece is found along the Bay Ridge Trail. Enter through the Arguello Gate and park near the Presidio Cafe. From here, hop on the trail and you will find it less than a quarter mile down the trail. Wood Line: This piece is in the southeast corner of the Presidio San Francisco. Enter through the Presidio Boulevard Gate and take a left onto Pacific. There is a small parking lot about a quarter of a mile away. Back track up Pacific and enter the trail on your left. You will easily be able to see and walk it on this trail. Tree Fall: This installation is an indoor piece Goldsworthy created in a structure the Army used to store gun powder. It's his third installation and you can visit it on docent led tours on the weekends from 10am to 4pm. It's located near the intersection of Sheridan and Anza Avenues. Earth Wall: His final piece is also indoors in the Presidio Officers' Club​​​​. It's open every Tuesday to Sunday from 10 am to 5 pm​. It's located at 50 Moraga Avenue. 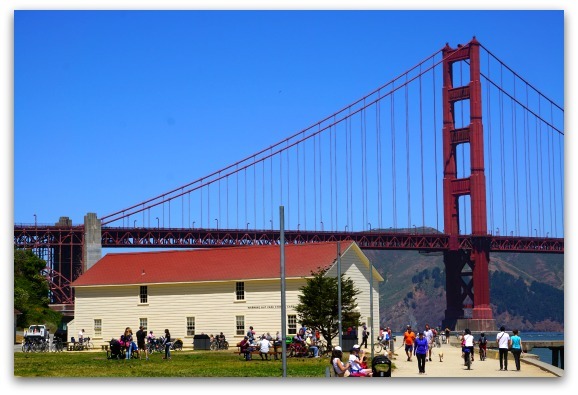 Golden Gate Bridge & Welcome Center: The southern entrance to the Golden Gate Bridge and its Welcome Center are also located in the Presidio San Francisco. You can walk along the eastern side of the bridge, check out its small outdoor museum, and grab a quick bit to eat. You can also spend time in the Welcome Center. Inside, you will find goodies and souvenirs all about the Golden Gate Bridge. The friendly staff will also help answer questions or point you in the right direction. This is also where the SF Muni bus station is located. Batteries Throughout the Presidio: There are 17 gun batteries throughout the Presidio San Francisco. These locations were used to protect the Golden Gate Strait and were stocked with ammunition and soldiers when it was an active Army Base. A few of them are still in great condition and fun to check out during your visit. Four of them are lined up along the coast just to the west of the Golden Gate Bridge. They include (from east to west) Cranston, Godfrey, Crosby and Chamberlin. Battery Chamberlin is home to a 50-ton, six-inch diameter "disappearing gun." The first full weekend of each month from 11am to 3pm, the National Park Service offers demonstrations of the gun and is there is answer any questions. The other one is on the eastern side of the Golden Gate Bridge and it's called Battery East Vista. This vista point was renovated in 2015 and offers amazing views of the Golden Gate Bridge and the SF Bay. Letterman Digital & New Media Arts Center: The next one on my list is a must see for Star Wars fans. The Letterman Digital & New Media Arts Building is home to Lucas Films. You will find a variety of statues outside. They also welcome visitors to their lobby of Building B. This is near the Yoda Fountain. Inside, you will find some memorabilia from the Star Wars Film Series. They are open during regular weekday business hours. It's a quick stop, but one you are sure to enjoy. Marshall's Beach: Just off the Batteries to Bluff trail, you will find this hidden gem in the Presidio San Francisco. There aren't any amenities here, but it offers gorgeous views of the bridge, bay and the Marin Headlands. It's a great place to come to relax and unwind. 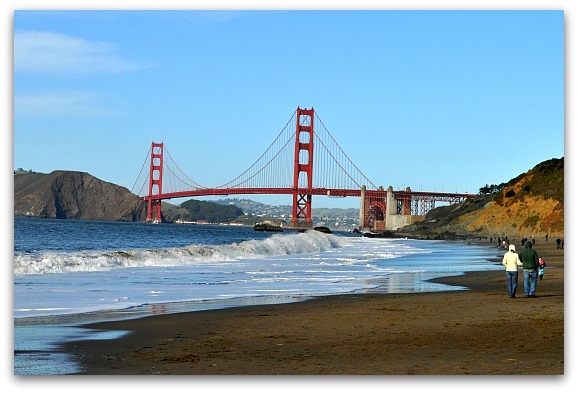 Baker Beach: You will find a second, larger beach just steps away from Marshall's Beach. Baker Beach is right off the Coastal Trail. You can access it in a few places including climbing down the famous Sand Ladder. Locals love this beach because it's large and has amazing views in every direction. Since it is rarely 'beach weather' in San Francisco, most residents use this recreational area as a place to hang out with friends or walk their dogs, rather than for sunbathing or swimming. Bowling: With real estate at a premium in SF, there are only four places to bowl in the city, and one of them is here. The Presidio Bowling Center and Grill was first created in 1989 to entertain the troops on base. It offers old-school fun with modern touches, like screens for automatic scoring, an internet-connected jukebox, and a selection of video games and pinball machines. The Grill serves up American classics, including burgers, wings, and corn dogs, as well as a full bar with a large variety of beer, wine, and spirits. You'll find this bowling alley in the Presidio San Francisco at the corner of Moraga and Montgomery Streets. They do not use formal number addresses, so use these cross streets to guide you to the building. Crissy Field: Crissy Field is another popular destination for both locals and those visiting San Francisco. Located on the northeastern side of the Presidio San Francisco, Crissy Field has a large beach, a running/walking trail, and plenty of green space for picnics, games, and other outdoor gatherings. This is another place where you can get full views of the Golden Gate Bridge. From Crissy Field, you can also see Alcatraz Island, Angel Island, the dome of the Palace of Fine Arts, and the town of Sausalito across the bay. On a warm, sunny day, this is one of the best places in San Francisco to hang out. You can also bring along a picnic lunch to sit back, relax, and enjoy the views. Biking: The Presidio San Francisco is one of the best places to go biking in the city because the streets are wide and there is very little traffic. Plus, you get great views of the bay. If you don't have your own bike, you can easily rent one here. With easy access to the Golden Gate Bridge, you may even decide to ride over to Sausalito for an unforgettable San Francisco experience. Fort Point National Historic Site: Fort Point is another highlight in the Presidio San Francisco, especially for history buffs. The fort was built at the height of the Gold Rush, equipped with 126 cannons and 500 infantry men. Today you might still see a battalion of soldiers marching by as part of a Civil War reenactment. 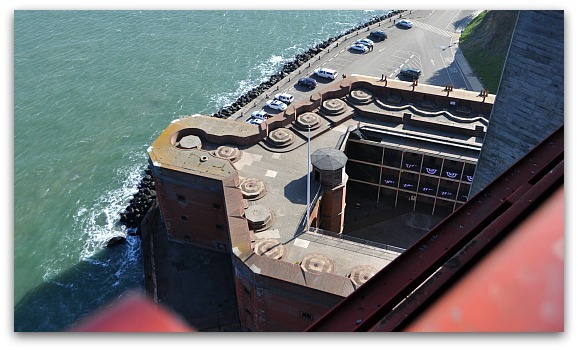 In the 1930s, the engineers of the Golden Gate Bridge thought this building needed to be demolished to erect the bridge. However, after careful consideration—and some outrage from local citizens—the engineers revised their plans and found a way to build the bridge around it in order to preserve this important historical landmark. Tennessee Hollow Watershed: Nature lovers will love exploring Tennessee Hollow Watershed. This large are is on the eastern side of the Presidio San Francisco. It covers more than 250 acres and almost 20% of the entire Presidio. It offers trails, native plants, artwork, and more. It's also home to the El Polin Spring which has an interesting history of its own. If you are traveling with kids, you can also stop by the Julius Kahn Playground with slides, swings and other fun kid activities. California Coastal Trail: If you love to hike, then you need to check out the Coastal Trail during your visit. This trail runs along the northern waterfront of the Presidio San Francisco and has some of the most beautiful views of the Golden Gate Bridge. You can pick up the trail at several locations within the park along Lincoln Boulevard. 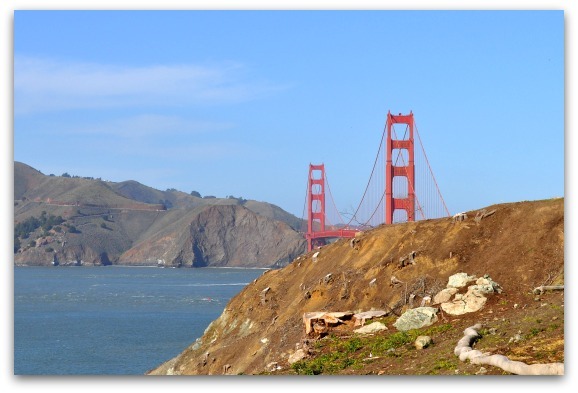 On this trail, you will get some of the most spectacular views of the Golden Gate Bridge. You walk near the water's edge most of the time and are also able to get some great views of the waters where the San Francisco Bay meets the Pacific Ocean. Presidio Officers' Club - A Museum and Cultural Center: You will find an interesting museum inside the Presidio Officer's Club. It offers a look at the history of the Presidio San Francisco. 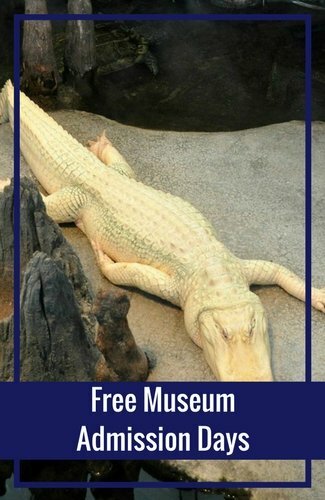 It's free and open to the public every Tuesday - Sunday from 10am to 5pm. Interfaith Center at the Presidio Chapel: One of my favorite stops in the Presidio San Francisco is the chapel near the cemetery. This small chapel is full of history and is a must-see for those visiting this part of town. 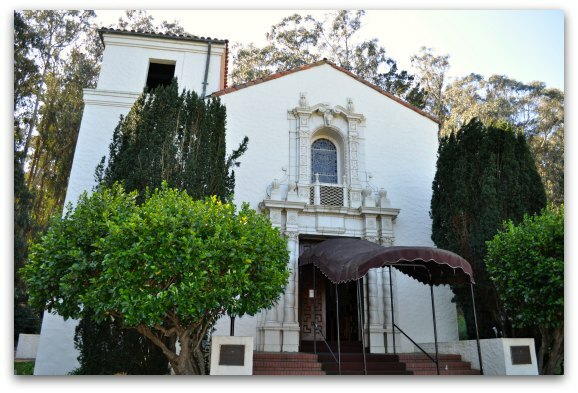 The Presidio Chapel dates back to 1931 and boasts beautiful mission revival architecture, a 33-foot fresco, stained-glass windows, and beautiful woodwork. Originally Protestant, it is now non-denominational and welcomes interfaith worship. The chapel is open on Sundays from 11am to 1pm. You can look around on your own or join a guided tour. Otherwise, the chapel is only open to guests who reserve it for ceremonies and events like weddings. 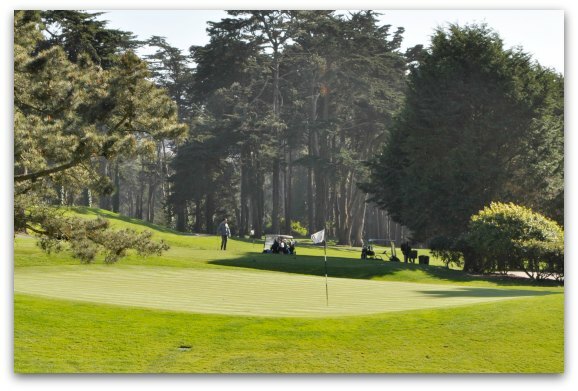 Golfing at the Presidio Golf Course: The Presidio Golf Course is one of just a few within the city limits of San Francisco. This nationally recognized course is popular with both locals and visitors. This San Francisco golf course was originally built in 1895. For almost 100 years, it was a private course just for those serving in the military. During the Presidio San Francisco renovation project in the mid-1990s, it opened to the public. Today, everyone is welcome to book a tee time. Beautiful Eucalyptus trees line this 18-hole gem. Golfers from around the world come to test out their skills on its hilly and challenging holes. There is also a driving range for those needing a little warm up before their game. The driving range on the Presidio Golf Course is also open every day. The hours are from 7 am to 7:30 pm Wednesday - Monday. They mow and do maintenance on the course on Tuesday mornings, so the driving range is open from 12 pm to 7:30 pm on Tuesdays. 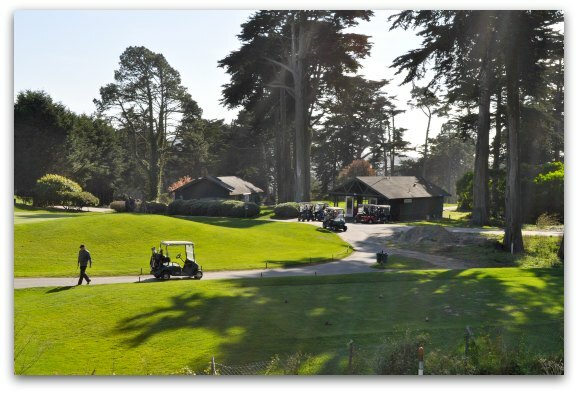 The Presidio Golf Course is open every day from dawn to dusk. There are three pricing tiers based on where you live. Prices also vary based on the day of week and if you plan on walking or getting a cart. You can book a tee time either online on their website or by calling 415-561-GOLF. Military Intelligence Service Historic Learning Center: Near Crissy Field on the east side of the bridge is the Military Intelligence Service History Learning Center. This small museum reconstructs the WWII history of the Japanese Americans that were recruited into the Army and living in this building when Pearl Harbor was attacked. It follows what their role was before the attack and what happened when orders were issues for the mass internment of around 120,000 Japanese Americans on the west coast. It's open on weekends from 12pm to 5pm. The cost is $10 per person. It's free to enter for Veterans and kids under 12. You will find it at 640 Mason Street. National Cemetery: The National Cemetery is a large military cemetery where 30,000 soldiers and family members are buried. 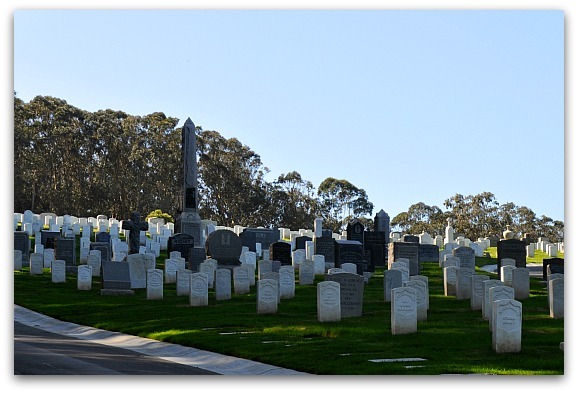 It is one of the only cemeteries that still remain within the San Francisco city limits. 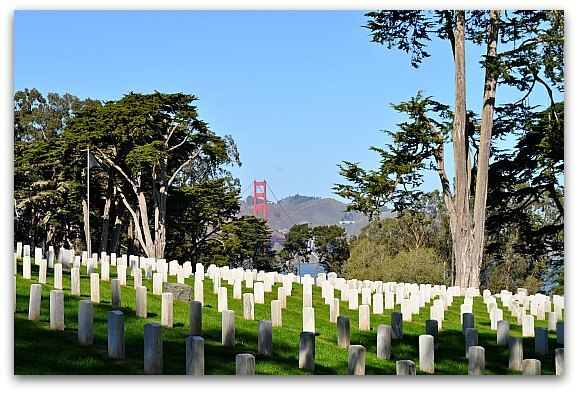 The army began using the cemetery in 1854, and in 1884, the government officially designated it the first national cemetery on the West Coast. It's a beautiful, green 29-acre site overlooking the San Francisco Bay. Indoor Activities for Kids: Along Crissy Field, you will also find three fun indoor activities for kids. The first is the House of Air Trampoline Park (926 Mason), where your kids can jump around all afternoon. The second is the Batter's Box (933 Mason) with indoor batting cages. The third is Planet Granite (924 Mason), an indoor climbing gym. 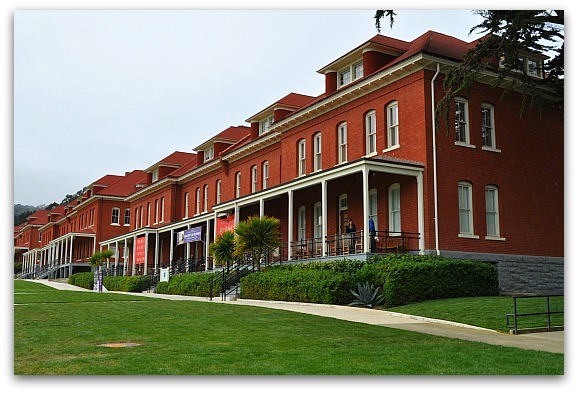 Walt Disney Family Museum: A newer addition to the Presidio San Francisco is the Walt Disney Family Museum. This is not an amusement park, but rather a fascinating look at Walt Disney, the man, and his business behind-the-scenes. You will learn more about his life, view photos of his family that you will only find here, and examine how he created such a successful company. Longtime Disney fans will enjoy artifacts like the 13-foot model of the original vision of Disneyland and the first-known drawing of Mickey Mouse. The museum also has speakers and shows a classic Disney movie each month. Arion Press: Another hidden gem in the Presidio San Francisco is the Arion Press. Step inside this printing press to see one of the last high-quality facilities that creates limited edition, museum quality books on a traditional letterpress printing equipment. They only print three books a year, but they welcome you to visit their press room, museum, and their entire facility. You can walk in and visit on your own from Monday to Friday between 10 and 5pm for free. You can also book a guided tour for $10 per person to see the printing press in action. Greater Farallones National Marine Sanctuary Visitor Center: Learn more about the Farallon Islands at this nature sanctuary in Crissy Field. It will tell you all about the birds and other animals that call this small island home. It's open from 10am to 4pm every Wednesday to Sunday. 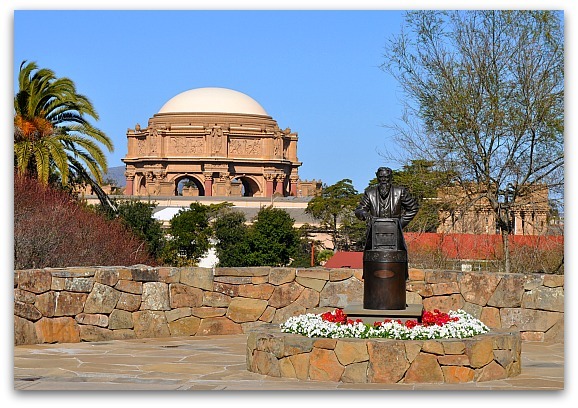 You will find a variety of tours offered within or through the Presidio San Francisco. Here are a few options to check out during your stay. Free Walking Tours: Inside the Presidio San Francisco, you will find a variety of walking tours. They include nature walks, art strolls, and more. You will find two or three a day and most are free. Visit the Presidio's calendar to find out which walks are scheduled during your visit. City Tour: Catch all the top sights on this 3.5-hour tour in a luxury motor coach. 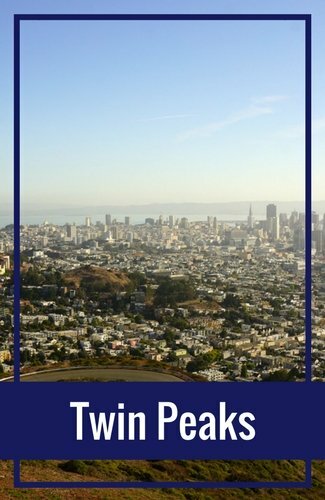 It includes stop all around San Francisco including Twin Peaks, Chinatown, North Beach and, of course, the Presidio San Francisco. This daily tour leaves at both 9am and 2pm. Visit GetYourGuide to learn more. Fire Engine Tour: This small group tour is in an open-air vintage red fire truck. You will start in Fisherman's Wharf, cruise through the Presidio San Francisco including a stop at Fort Point, you then then make your way over the Golden Gate Bridge and back to your starting point. On this 90-minute tour, you will learn all about these top SF attractions. 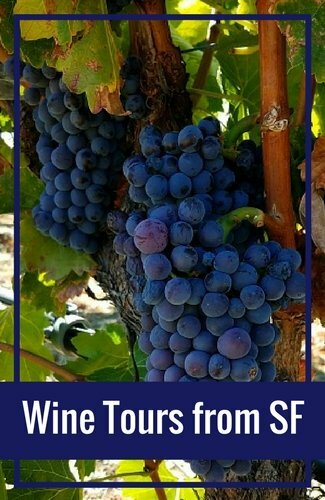 Visit Viator to find upcoming tour dates and availability. GoCar Tour, Golden Gate Bridge & Lombard Loop: You will see these small, yellow, two-seater cars all over town and now is your chance to try one! 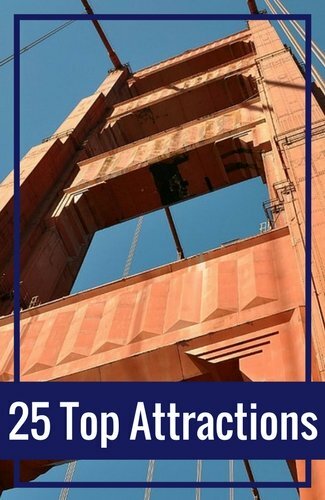 This loop offers you the chance to get a closer look at top attractions as well as the Presidio San Francisco. In car audio, will guide you through the route and you can stop at as many places along the way as you want. Learn more on GetYourGuide. In the spring of 2012, the first and only hotel opened within the park gates. It's managed by the Presidio Trust, the agency in charge of the Presidio San Francisco. The Inn at the Presidio is not your normal hotel. It's located at Pershing Hall, once an elegant home for bachelor officers when the Presidio was a military post. It was remodeled to include 22 spacious rooms, 17 of which are suites with gas fireplaces. Staying at the Inn at the Presidio is a unique experience. It's a peaceful and quite retreat that is just steps from a major, thriving city. Rooms here start at around $325 a night. If you are looking for a quiet, serene getaway within the city, there is no better option than the Inn at the Presidio. If you prefer to stay nearby the Presidio San Francisco, you will also find several, more affordable options within steps of its gates. Here are a few more options to consider. Travelodge by Wyndham Presidio San Francisco (2755 Lombard Street): 2-star hotel with high marks from its guests. It's just outside the Lombard Street gate near the Letterman Digital & New Media Arts Center. Read recent reviews and check for availability on Booking.com. The Laurel Inn (444 Presidio Avenue): This cute hotel is just a couple of minutes away from the Pacific Gate and is in the Pacific Heights neighborhood. This 3-star hotel is also close to several great local restaurants. Read reviews from recent guests and check availability on Booking.com. Monte Cristo Bed & Breakfast (600 Presidio Avenue): Just across the street from The Laural Inn is the cute, 3-star Monte Cristo Bed & Breakfast. This small hotel offers antique furniture and an elegant lounge area for you to relax after a long day of exploring. Discover recent reviews and check for availability on Booking.com. 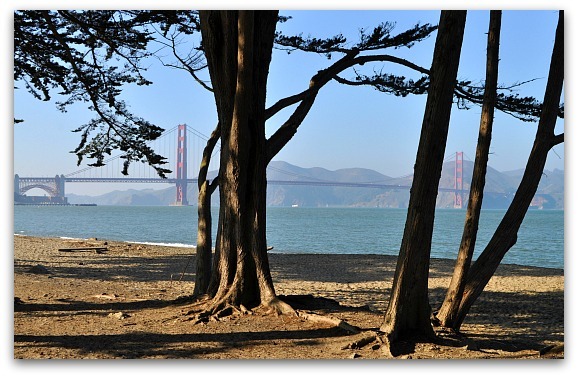 Presidio Picnic: Head over to the Presidio San Francisco between mid-March and mid-October for their Sunday Picnic. Each week, 25 food trucks will be lined up around the Main Parade Ground. They will be serving a variety of international cuisines from 11am to 4pm. Presidio Twilight: The evening version is the Presidio Twilight. 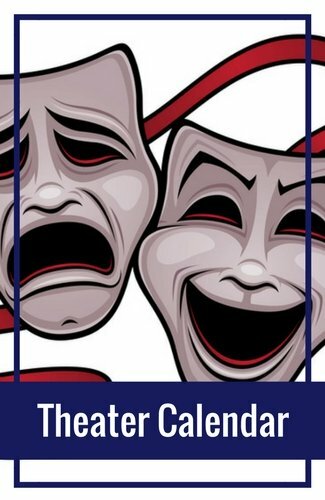 This event is held on Thursday nights between mid-May and mid-September. They feature more than a dozen food trucks serving amazing dishes between 5pm and 9pm. Kite Festival: Every June is one of my favorite festivals, the Kite Festival. 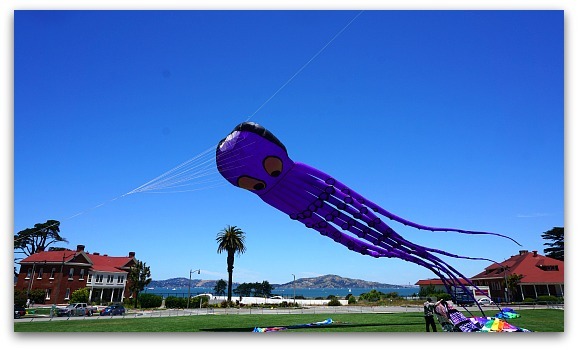 Spend the afternoon on the Main Parade Ground and watch some of the most amazing kites fly high above San Francisco. There is also live music, food trucks and other entertainment. Visit my June calendar to learn more. Memorial Day Ceremony: Each year on Memorial Day, there is a large ceremony at the National Cemetery. It includes a military parade, a variety of speakers, and ends with a 21-gun salute. Learn more about this year's event. Holiday Tree Lighting: Every year, you will find a family-friendly tree lighting ceremony here. It includes activities for the kids, a guided lantern walk, light refreshments, and more. Visit my tree lighting page for details on this annual December event. There are now a variety of places to eat within the Presidio San Francisco. Here are just a few of the top options. Warming Hut Cafe: This is a great place to grab a quick sandwich or salad as you are exploring Crissy Field. It's a popular place and a great place to stop to relax or grab a coffee during your visit. You will see it in the picture below. It's located at 983 Marine Drive. It's open daily from 9am to 5pm. Presidio Social Club (563 Ruger St): The Presidio Social Club is a hidden gem inside of the Presidio San Francisco. It serves fresh California cuisine, including a hearty brunch on Saturday and Sunday mornings. Some of my favorites include their salmon pizza, Dungeness crab louis sandwich, and the gourmet mac and cheese. Most of the seating is inside, but make sure you ask for a seat outside if it's sunny. The patio is small, but a lovely place for lunch or dinner. It's open for lunch, dinner and brunch on the weekends. Presidio Palms Cafe: Located in the Main Post's Building 39 (39 Mesa St, Suite 108), this casual restaurant with fresh California dishes such as salads, soups, and baked goods. It's only open on weekdays from 8am to 4pm (closing at 3pm on Friday). Cafe RX: Another great casual breakfast and lunch spot is Cafe RX (1013 Torney Ave). It's open during the week from 7am to 2:30pm and serves up bagels, sandwiches, and salads. The owner is from El Salvador, so you will also find some tasty Latin inspired dishes as well. Arguello: This modern restaurant offers tasty Mexican dishes. Head over to lunch, dinner or happy hour. They are open Weds - Friday from 11am to 9pm, Saturday from 11am to 3pm & 4pm to 9pm, Sunday & Tuesday from 11am to 4pm. They are located in the Presidio Officer's Club at 50 Moraga Ave. Sessions at the Presidio: One of my favorite places for dinner is Sessions. They serve lunch, dinner and weekend brunch. I love them for their hanger steak and burger are amazing. I also like their vegan burger as well as the meat and cheese try. If you love craft beers, you won't go wrong spending an evening here sampling from their large selection. You will find Sessions in the Letterman Digital & New Media Arts Building (1 Letterman Dr #150, just inside the Chestnut Gate at Lyon Street). Hop On/Hop Off: The Hop On/Hop Off Bus Tour stops near the Walt Disney Museum in the heart of the Presidio (H on the map). 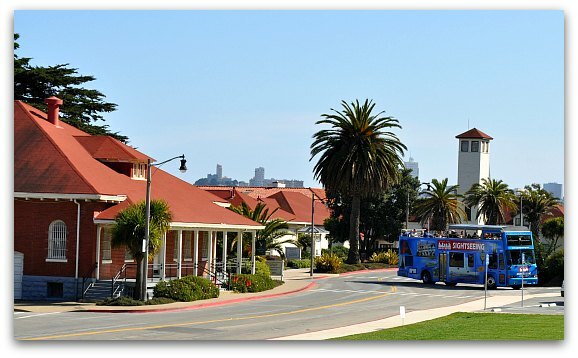 From here, you can walk to many of the sites listed above or take the PresidiGo (see below for more information on this free shuttle around the Presidio San Francisco). 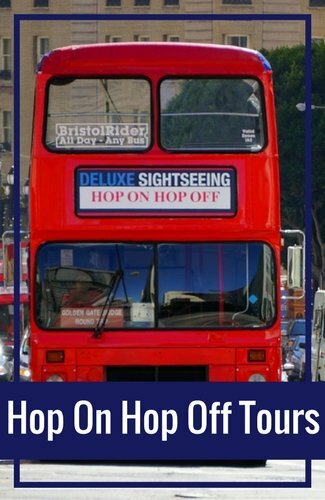 Find out more about all of the stops for the Hop On/Hop Off Bus Tour of San Francisco. Bus: Muni bus is another option, although only a few buses have stops inside the Presidio San Francisco. From Union Square, you can take the 1 California to the Arguello & California stop and then transfer to the 43 Masonic. The 43 Masonic has three stops right in the Presidio, so you can easily get to the heart of the action (shown as B43 on the map). You can also take the Union 45 bus, which drops off outside the Lombard Gate at Lyon and Greenwich (shown as B45 on the map). You can then either walk around or take the PresidiGo to get to your destination. Car: This is one of the few places in San Francisco where it is easy to park. However, make sure you read the signs carefully before you leave your car. 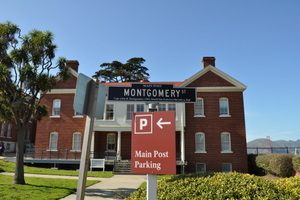 There is a large parking lot on Montgomery Street near the Main Post, close to the Walt Disney Museum and the bowling alley. Other spots are dedicated to those with permits during the week but are usually open for others on the weekend. You can also sometimes grab a spot on the street outside the Lombard Gate. The three lots marked on the map above (P) are full time visitor parking lots. PresidiGo: The best way to get around the Presidio San Francisco once you arrive is by taking the PresidiGo. This is a free shuttle service with designated stops throughout the park. There are two routes, the Crissy Field route (the best one for most attractions) and the Presidio Hills route (takes you out to Baker Beach and past the golf course). Each stop is well marked with a map of all of the shuttle stops. You will need to be a little careful with this option if you're on a time crunch, though, as the shuttle does not run frequently and sometimes gets behind schedule. Each route has more than 20 stops and takes about 45 minutes or more to complete the full circuit. Below you will find some of the major stops on each route. 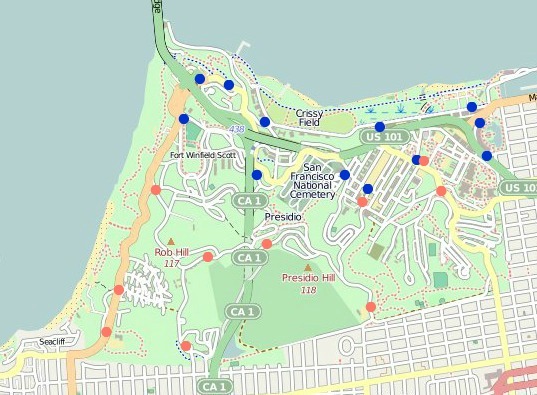 The Crissy Field route is in blue and the Presidio Hills route is in light red. Walking: My favorite way to explore the Presidio is on foot. You can walk up the hills to get some great views of the bay, Alcatraz, and the city of San Francisco. The streets here can be a bit confusing, so this is one of the easiest ways to get around.